The Mara Salvatrucha. Photo by Matheus Kawasaki, via Flickr. I spent much of the 1980s immersed in the movement that tried to end the tortuous U.S. wars in Central America. We marched and organized to challenge the Reagan administration’s policies that were steadily inflicting death across Nicaragua, Guatemala and El Salvador. Some of us traveled to the region with groups like Witness for Peace to see this human catastrophe for ourselves. We especially grieved the infrastructure of war that had been flung across the region: organized death squads, paramilitary forces and militarized societies fostering a culture of devastation. When we oppose war, we do so because of the incalculable cost in human lives and potential. But we also protest the costs that are unfathomable at the outset. War, like all forms of violence, unleashes unforeseen consequences that are often deeply destructive. This fallout, like its radioactive namesake, often has a half-life that continues long after the original conflict is over. 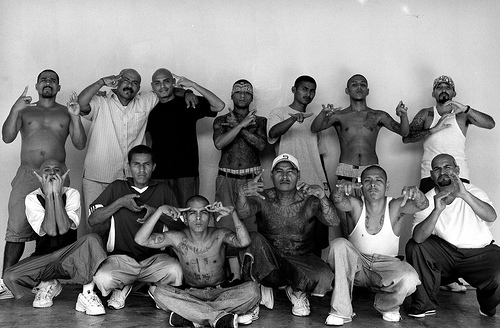 One unexpected consequence of the U.S. wars in Central America was the emergence of youth gangs in El Salvador (including Mara Salvatrucha, also known as MS-13, and the 18th Street Gang) and the fratricidal violence between them. El Salvador became one of the most violent nations on earth, with a murder rate that surpassed 70 per 100,000 in 2011, and 90 percent of all homicides are gang-related according to the government. A few months ago, a truce among the gangs was brokered that has now surpassed its first 100 days. While these kinds of ceasefires have failed in the past, there is a quiet optimism that it will hold. A powerful transnational initiative, this peace process is rooted both in a war that raged 30 years ago and a longing to grapple with that war’s long-term legacy. In the late 1980’s, young Salvadoran immigrants, largely war refugees, banded together in Los Angeles often to defend and protect themselves from existing gangs. Eventually, in the Pico Union neighborhood of Los Angeles, MS-13 [Mara Salvatrucha] was born. A little over twenty years ago, the Peace Accords were signed marking the end of El Salvador’s brutal 12-year civil war between the FMLN guerillas and a government that was backed by the United States with nearly $4 billion in military and other aid. The United Nations Truth Commission found that of the more than 75,000 people killed, the government and paramilitary death squads had been responsible for 95 percent of the deaths. The war also resulted in the separation of hundreds of thousands of families as people fled for their lives to the U.S. and across the globe, sometimes leaving children behind with relatives to care for them for several years. Many lost at least one parent during the war. Many others were never reunited with parents that did survive. After the Peace Accords were signed, deportations of undocumented Salvadorans from the U.S. were ramped up. Then in 1996, the Immigration Reform and Immigrant Responsibility Act, made it so that people with green cards, and not just people without documents, could be deported for a range of convictions. This sped up the deportation of gang culture in El Salvador. But in the years after the war, the country was not equipped to integrate deportees, or to provide a safety net for youth in general. Brokered by a Catholic bishop and a former guerrilla commandant and legislator, between incarcerated leaders of MS-13 and the 18th Street Gang, the truce has had immediate results. Since March an estimated 800 lives have been saved, as homicide rates have fallen from 13.6 per day to about 5.7 per day, or a 58 percent reduction. to work for the safety of those involved in the Salvadoran truce, doing an inventory of the gang members specific needs, and building support and resources for the community-led process. It was also announced that the secretary-general of the Organization of American States (OAS) was set to travel on a visit to El Salvador to support this effort, to be followed by United Nations and European Union representatives. While long-term success is not a foregone conclusion — much of this depends on the political will in El Salvador, including a shift in government strategies for addressing gang-related violence and grappling with the deep structural challenges of poverty and economic injustice — there is a growing sense that change is possible. In the 1990s I worked closely with Leonardo Vilchis, a community-based organizer who helped gang-members and the community in East Los Angeles create the conditions for peace. Based at the time at Dolores Mission Church — which, under the leadership of Fr. Greg Boyle, helped lay the groundwork for the still-thriving Homeboy Industries that is part of the new Salvadoran gang peace coalition — Vilchis shared how the gang culture in L.A. was being exported as people returned home after the war. He and many others were tirelessly working to create a culture of peace and justice through many powerful initiatives (Vilchis went on to lead La Union de Vecinos) in the U.S. and in Latin America. These relentless, decades-long efforts have born much fruit — including a truce that has saved lives and may serve as the foundation for a more durable peace. Great news! We are exporting some good stuff back to El Salvador. Lord have mercy for our past (present) sins.